“I’m from Grande Prairie and very proud of that,” asserts Clint Malarchuk who was born in Grande Prairie and moved to Edmonton at the age of five. Whenever possible he returned to Grande Prairie, where Clint learned to skate and play hockey. On his Uncle Max Henning’s acreage outside of Grande Prairie and the Finch’s ranch south of town, he developed his love for horses leading to his hockey nickname “The Cowboy Goalie”. 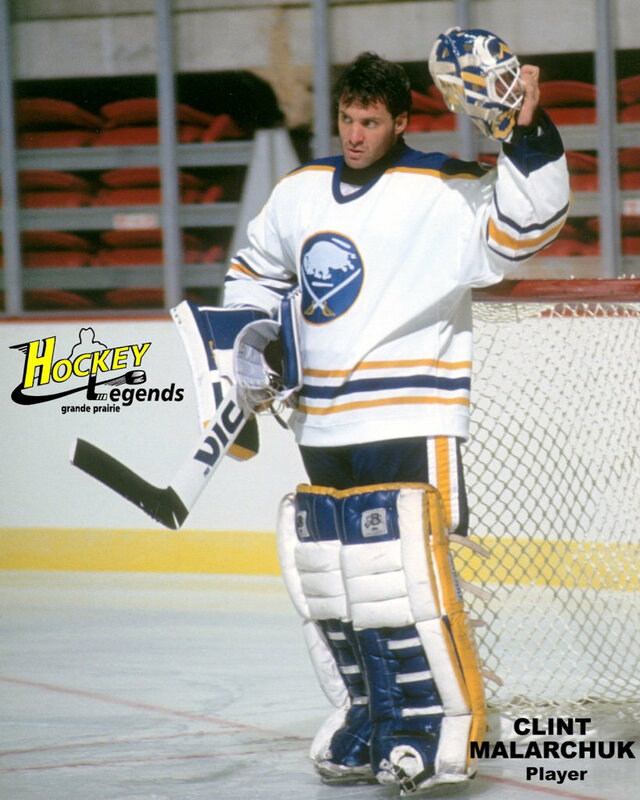 After playing junior hockey in Portland Clint had a decade long professional career in the NHL playing with the Quebec Nordique, Washington Capitals and the Buffalo Sabres earning a positive win/loss record of 141 wins, 130 losses, 45 ties, and 12 shutouts. He then coached in the minors for the Las Vegas Thunder and the Idaho Steel Heads, and ended his professional career tutoring goal tenders for the Florida Panthers, the Atlanta Thrashers, the Columbus Blue Jackets and the Calgary Flames. During an NHL game in 1989 Clint’s throat was slashed by an opposing player’s skate and but for the quick thinking of the team’s trainer, Jim Pizzutelli, he would have bled to death on the ice. However, Clint is not defined by his record as an NHL player or by the highly publicized accident on the ice. In 2014 with the help of Dan Robson, Clint completed his autobiography, The Crazy Game: How I Survived In The Crease and Beyond. It was the most difficult assignment he had ever engaged, exposing the emotional demons that had haunted him all of his life leading to a suicide attempt. Clint reports that all the pain and struggles are made worthwhile when at book signings people share comments such as “Thanks, you saved my life.” That’s powerful stuff.